Dulough is the mysterious house at the heart of this debut novel from Johanna Lane. The house is fictional but the setting reminds me of one of my favourite locations in Donegal, Dunlewey Lough at the foot of Mt Errigal overlooking the Poisoned Glen. In Black Lake this already wild landscape is battered by the winds coming off the Atlantic. There is a savage aspect to the environment, a primitive, ancient ambience dating back to the Ice Age. The Campbells are relative newcomers, the first of their tribe arriving in the early 1850s. Scottish landowner, Philip Campbell who built the house/castle, Dulough, in 1854, cruelly evicting any tenant families who stood in his way. Now, the roles are reversed as John Campbell, the current owner, can’t afford the upkeep of the house and enters into a contract with the Irish government whereby the house is shown to visitors as a tourist attraction and he and his family relocate to a cottage in the grounds. There is a simmering resentment between the Campbells (landed gentry) and the locals (peasants…not really!). John’s young son, Philip, feels particularly affected by the downsizing and is loathe to abide by the new rules and regulations. The mother, Dublin born Marianne, seems out of place in this desolate setting no matter what size of house she’s in. The daughter Kate tends to go with the flow and tries to keep the peace. You just know that something bad is lurking round the corner. This is a solid debut from a talented writer. It’s a gentle, slow-moving story dominated by the austere, sombre landscape. You wonder how anyone can thrive in such harsh surroundings at the mercy of the elements…and the recession. I found echoes of William Trevor’s The Story of Lucy Gault in this ethereal tale of displaced gentry. Looking forward to seeing how Johanna Lane’s writing evolves in the future. My thanks to Little Brown and Company for providing a review copy. 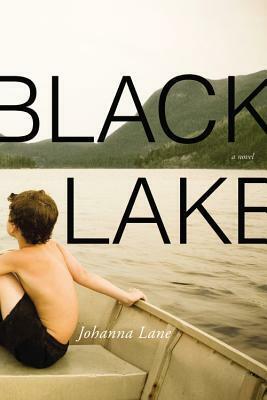 Black Lake is published by Little Brown and Company on 20th May 2014. This entry was posted on Monday, April 14th, 2014 at 10:39 am	and is filed under Contemporary Fiction, Proofs. You can follow any responses to this entry through the RSS 2.0 feed. You can leave a response, or trackback from your own site. I’ll be reading this in a couple of weeks… sounds like I’m in for a treat! I’ve just started this one, the author has said that the house is based on Glenveagh Park in Donegal, so you were spot on. It’s great to read a book set in a place that you know and love, adds so much. Glenveagh is beautiful. I love the setting. Donegal adds to the oppressive atmosphere.